It was a bright morning in Abuja Municipality, the capital of the mongrel enclave that parades herself as "the giant of Africa" but full of religious intolerance, political-poisoning elements and instabilities, tribalism, nepotism, wars, police and army intimidations, extortions and brutalities, extra-judicial incarcerations and killings and frequent cases of state-sponsored terrorism etc. The day was Monday, the 20th day of the month of June in the year 2016. A noble and courageous freedom fighter, Nnamdi Kanu was billed to appear before Nigeria's most corrupt judge, right from Kuje maximum prison where he has been unlawfully incarcerated for almost a year by the Nigerian DSS. Last Monday was his first appearance in court in the month of June, and attracted many foreign press who thronged Wuse high Court to have a glimpse of the die-hard icon. His appearance was not only greeted with enthusiasm as he beamed with broad smiles that shattered every negativity of the executive and judicial conspiracy. 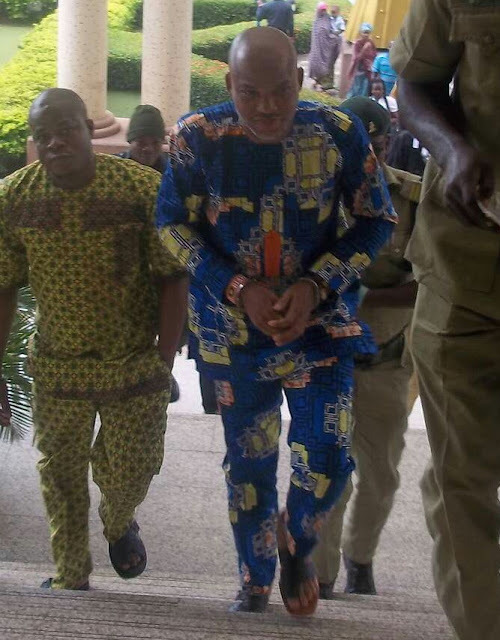 In his right wrist was a bracelet with the inscription "I Love Biafra", a message he has never ceased to convey in the courts since his illegal arrest. It would be recalled that Nnamdi Kanu in one of his appearances in court wore a white lace with Biafra insignia on the pocket to tell the world what he stands for despite his unlawful detention in prison. It is a wonderful and applaudable display of commitment, courage and conviction. A black man with such a zeal, discipline, integrity, and piousness. No wonder Nigerian corrupt politicians want him eliminated. Those rogue politicians who would easily sell their conscience and people for selfish gains like the Biblical Esau. Nnamdi Kanu is quite different. When some Biafrans of Igbo extraction are busy selling themselves to the Northern APC Islamic Jihadists, Nnamdi Kanu comported himself and detached himself from every defilement and took the path to champion the course of liberation for his people who have been under severe political, economic and inhumane conditions orchestrated by the Northern political class whose sole aim is nothing but to conquer, enslave, and Islamize Biafra and Biafrans with impunity. Read also:NNAMDI KANU HAS SET THE PACE...BIAFRANS FIGHT FOR YOUR HERITAGE: BIAFRA- FREEDOM!!! They have destroyed social justice in the society to the extent that whoever speaks against it or challenges their atrocities and injustices like Nnamdi Kanu, is seen and treated like a "criminal" while the real criminals roam about committing their atrocities with impunity. The law means nothing to them as they assume their dogmatic Islamic views take precedence in a secular society and judges who uphold this gruesome dogma are rewarded handsomely. Anyone who hopes to get justice in the reckless Nigerian enclave, should rest assured it will not come. Nigeria is not a land of peace and harmony, she took a cue from Britain that colonized her. All her actions even to the smallest matter that attracts no confrontation becomes excessive violence and war. Her army is at war with the citizens on daily basis on the streets and high ways where they extort money from motorists and cyclists at gun-point. "Who will speak for the oppressed people who are made to share their hard-earned money under duress with the army and police on numerous check points? 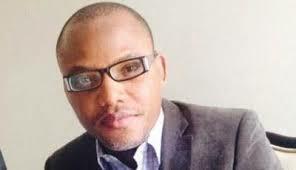 It is only Nnamdi Kanu who has the quality and courage to speak out as he has always done. His presence in court last Monday has not only reshaped the court proceedings, but threw the Nigerian opponents off balance. At least the society has begun to learn that money is not everything. They have also seen that death is not the answer to Biafra agitation and should reconsider that a person like Nnamdi is willing to die for Biafra just like thousands of his kith and kin who share his genuine love for justice and equity and others who were brutally murdered on the 30th of May Biafra remembrance day celebration. The various press that attended the court proceeding last Monday should pass the information of their keen observation to the entire world unhindered. Let the United Nations, European Union, Africa Union, Human Rights Watch and other governmental and non-governmental organizations who love justice take note of the courage so exhibited by such a man in the face of death. The world should realize that it is the failure to administer justice just as Nigeria is doing, that triggers war and bloodshed. They can avert the lingering doom if they so wish but let it be on record that a cry to prevent it was made but that it fell on deaf ears either by criminal omission or by deliberate commission. A word, they say, is enough for the wise.